The Normanhurst consists of a Residential Hotel, Nursing Home & EMI Home, catering for the active retired, elderly frail, post operative or mentally frail. 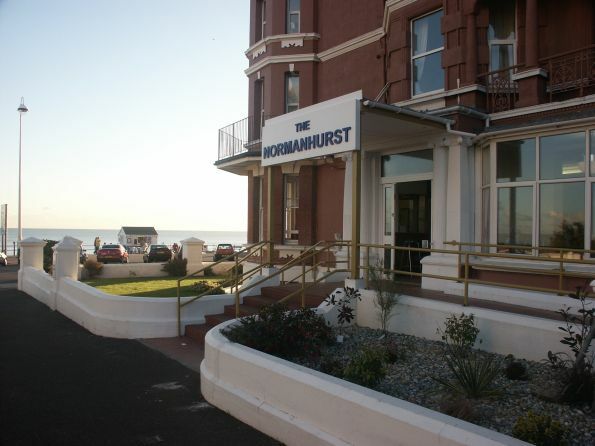 The Normanhurst has been in the same ownership for over 45 years and was the first residential care home in Bexhill to register with the local authority. We are a registered Care Home within the 1984 Act and are registered with the Care Quality Commission (CQC), which is responsible for ensuring that all standards are maintained to the high levels set by themselves. We aim to provide a caring environment, within a hotel setting, in which our residents can live in dignity and comfort, free from the worry of managing and owning their own home. We will give every resident the freedom to not have their lives organised, beyond that which is dictated by the practical considerations of organising the catering and cleaning of the home, into activities and lifestyle they may not wish to follow. We treat people as individuals, not as social experiments or units to be processed. Our approach is, as near as possible, that of a caring relative, albeit on a commercial basis. We are conscious that at all times our residents have a choice and are under no obligation to continue their stay with us beyond the end of the week. The Normanhurst is a large corner site overlooking the sea (click here to see some photographs of our views). There is a small lawn at the front of the Residential Home with a garden at the rear of the Nursimg Home. There are plenty of shops, banks, churches and other amenities, including good rail and bus services within easy walking distance. See the bird's eye view of our Interactive Map to clearly see our location. The residential hotel has three lounges overlooking the sea, one with a television for those residents who choose not to have a television in their own room. The Annex has two lounges, one with a TV, that are separate from the others. Similarly, the nursing home also has its own lounge. All parts of the buildings are served by lifts, with two in the hotel. We aim to create a warm, friendly atmosphere where residents feel safe and protected. All our rooms have central heating. Additionally they are all tastefully decorated and nearly all have en-suite facilities. Residents are welcome to bring their own furniture, however pets are not permitted. Each room has a telephone connected to our switchboard with a direct dial facility and televisions can be installed free of charge. Carers, nurses and first aiders are on duty 24 hours a day, should you need them. There is always one RGN on duty in the Nursing Home 24 hours a day and a number of auxiliary nurses. All public bathrooms, toilets and private facilities are linked into our modern 'Nurse Call' system. Your security and peace of mind is our concern at the Normanhurst. The majority of our staff have NVQ level 2 or higher and more are training for it. We actively encourage our staff to undertake training and pay for their studies. We have in-house as well as outsourced training. Staff who are qualified to train others and outside trainers, where we do not have the in-house expertise, teach courses on site. We have some spectacular views from many parts of the Normanhurst; none more impressive than those from the Turret rooms on the sea front, which afford views from Beachy Head round to Hastings, taking in the De La Warr Pavilion along the way. Click here to see some example views. A monthly newsletter for the residents is produced and there are quarterly resident meetings. An example newsletter can be downloaded from here.